When Hobbies Collide! I love to knit, and I love to pack lunches, so what could be better than knitting things for packed lunches? 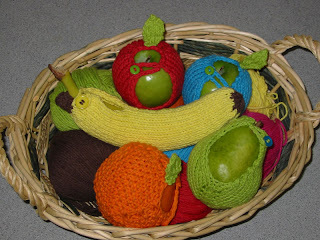 This summer I've been knitting fruit cozies: cotton jackets made to keep fruit from getting bruised in a lunch bag or purse. So far I've made (clockwise from bottom left) an orange cozy, a banana cozy, two apple cozies, and a pear. I left off the collar on the apples, because I didn't like it. I added a little leaf to most of the fruit (CO 3 st; Row1 knit; R2 purl; R3 K1f&b, K1, K1f&b (5 st); R4 purl; R5 knit; R6 purl; R7 K2tog, K1, K2tog; R8 purl; R9 Sl 1, K2tog, psso; weave in ends and attach to the cozy). I knit an extra 5 rows before casting off to make the pear. I knit the same cozy pattern in seed stitch for the orange. I'm still playing with it and will probably go back and make the cozies bigger (especially the orange -- man, the oranges I found at the market today were bigger than the grapefruit!) and change the construction. If I do, I figure at that point I will have gotten far enough away from the original that I'll feel safe posting the new pattern here. Of course, I also needed a banana for my collection, and since I couldn't find a pattern for a banana cozy, I made one up! Go ahead and download my Banana Cozy Pattern and make your own. And don't worry, there's plenty of time to get it done before school starts again! So, how's your Summer Veg Out going? Now that the veggies are easy-access and the fruit smoothies are flowing, I bet your kids are chowing down like never before! No? If the kids still aren't biting (or even if they are), how about taking their fruits and vegetables for a dip? Kids love dipping their food into other food (just consider that popular little vehicle for ketchup, the french fry). 1. First off, it's hard to go wrong with good ol' hummus (pictured here with a zucchini chip). Hummus is a classic, but you can also branch out and make bean dip out of any beans or legumes you like. We especially love the "cheesy" bean dips in Ultimate Uncheese, the ranch-flavored bean dip in Vegan Lunch Box, and spicy canned refried beans. 2. 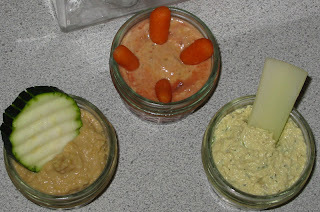 The crazy-looking carrot dip pictured here is one of my very favorite things EVER. I put it on green salads, beans and rice, steamed vegetables, raw tomatoes...pretty much everything except my morning oatmeal. It's a spoonful of Yumm! Sauce mixed with picante salsa. We're talking eyes-rolling-back-in-the-head good. Yumm! on its own is to-die-for, of course, but I totally love the extra bite of spicy picante mixed in, and the fact that mixing it like this cuts the fat down quite a bit. If you don't have any Yumm!, picante salsa mixed with mashed avocado would also be excellent. 3. Another high-protein dip that I particularly like on celery is Toby's Classic Lemon Dill Tofu Paté. It tastes a lot like egg salad! Be careful when shopping for Toby's, though, as only the Lemon Dill -- aka Lite Eggless -- paté is vegan. 4. Nut butters like this almond butter make a great dip for apple slices, bananas, and baby carrots (and -- let's be honest -- your finger, a spoon...). Nut and seed butters are high in protein and the healthy fats that are so crucial for growing bodies. 5. 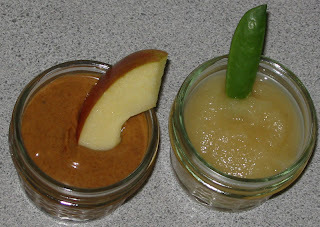 This summer my four-year-old niece taught me that even applesauce can be a fun dip! She dipped sugar snap peas, apple slices, and baby carrots into applesauce the last time she was here and crunched away. 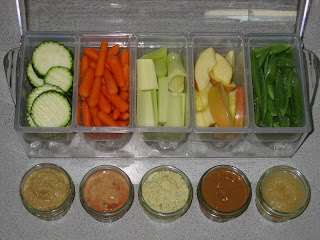 Such a simple way to make veggies a little more interesting and fun! How about it: what are your favorite dips? ANYway! That last discussion started as an aside and grew into its very own post. Now that it's out of the way, let's get on with it, shall we? While we were on vacation this weekend I noticed two new nondairy, soy-free yogurts at the store we went to. Excitement! Yogurt was one item where I couldn't find a way to get away from soy. We bought two containers and brought them home in an iced cooler so we could write this very cultured shmoo review (heh heh). 1. Blueberry Ricera Rice Yogurt. I couldn't wait to try this one, as I love rice and had an image of a thicker, creamier version of amazake. However, our first glimpse at its runny consistency and grainy texture did not inspire much confidence. Shmoo and I both took a taste and made faces. It was gritty and bitter, with a sharp, biting flavor that stays in your mouth long after you swallow. Big thumbs down from shmoo. Perhaps it would be better in a smoothie? We decided not to chance it and threw the rest away after a couple more bites. Verdict: Nasty! 2.Vanilla So Delicious Coconut Milk Yogurt. 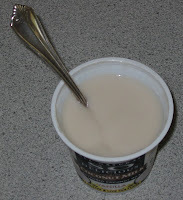 This yogurt looked like a winner as soon as I put the spoon in: creamy and thick like real yogurt, with beautiful color. I took a taste and smiled. Mmmm, that's more like it! It's smooth and luscious, like coconut milk pudding with a hint of yogurty tang. It also doesn't have that soy aftertaste I dislike in soy yogurt. Verdict: Beyond Excellent! Shmoo and I both give it big thumbs up and will be begging local stores to carry it. 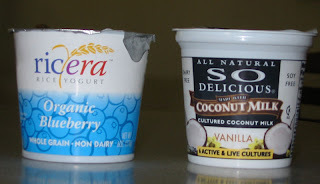 I'll leave it to some of you to decide which nondairy yogurt is better nutritionally: soy, rice, or coconut? Coconut had the most fat (6 grams, all saturated -- no wonder it tasted so good! ), but coconut also had fewer calories than rice or soy (150 vs. 180 in the rice and 160 in the soy). Both coconut and rice lack the protein of soy (4 grams in Silk Cultured Soy, 3 grams in Ricera, and only 1 gram in the Coconut Milk Yogurt). Sooo many people have asked me if I worry about feeding my son soy. To be honest, sometimes I do. Although I don't buy into the soy controversy so much that I've cut soy out of our lives, I do think that too much of any one food can be bad for your health, and I don't like how much highly processed soy has found its way into the average vegan diet in recent years. It's possible to transition to a vegan diet and still eat all the same foods you ate before, only made from soy instead of meat and dairy. We're talking soy three, four, or more times a day: soy milk in your coffee and on your cereal in the morning, soy lunch meat and soy cheese on your sandwich at lunch, a soy protein bar for a snack, soy chicken with rice and vegetables for dinner, and some soy ice cream for dessert. This style of eating is easy for most Westerners to transition to. It's nonthreatening, marketable, tasty, and animal-friendly, but to be honest, I worry that it's just too much. All that highly processed soy can't really be good for us in the long run, especially when it takes the place of other foods that we could be eating instead: fruits, vegetables, beans, nuts, seeds, whole grains, etc. In our kitchen I try to strike a balance. We stopped drinking soy milk quite a while ago; instead I rotate through several different varieties of nondairy milk like almond, rice, oat (our favorite), hazelnut, and I even just bought my first box of hemp milk. I make fruit sorbet and smoothies instead of buying soy ice cream. I make Magical Loaf patties instead of buying soy burgers. But I also love tempeh and tofu, and although I never touch them myself I do buy my son his favorite soy hot dogs, deli slices, chicken nuggets, and Silk yogurts. We both enjoy veggie burgers occasionally when we go out. So there you go: I'm not entirely one way or the other about soy; I'm just somewhere in the middle, I guess. Wow! I'm glad everyone is enjoying the Summer Veg Out posts -- the feedback has been great! 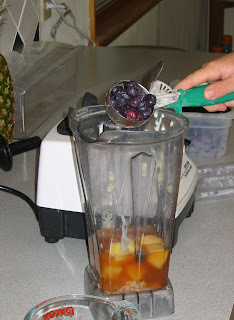 Smoothies are another way to make fruits (and, to a lesser extent, vegetables) fun and easy in the summertime. We make smoothies every day for breakfast or a healthy snack. Now that my son is almost 10 he likes to show his independence and make his own. 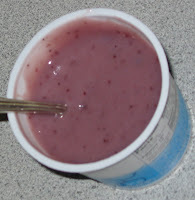 However, we started having problems with his idea of how much frozen fruit to use; it was not uncommon to find that he had thrown over 3 cups of frozen blueberries in the blender to make one breakfast smoothie. Talk about expensive!! This spring when I started working at the smoothie bar I was struck by how easy and attractive it was to make smoothies when the frozen fruit was put into bins instead of bags, and a scoop was kept in the freezer next to them. So that's what I did: I purchased square bins at the wholesale grocery store, just like they use in restaurants, and a 3 oz. ice cream scoop. 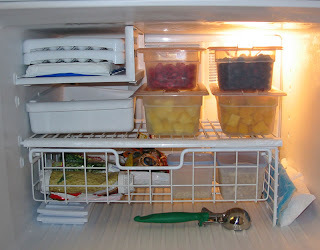 Here's a picture of my freezer with bins of raspberries, blueberries, pineapple, and mango. ...a scoop of ice, a scoop of frozen pineapple, and two scoops of frozen blueberries. 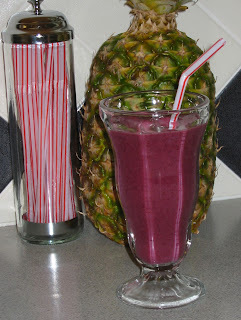 Viola -- yummy smoothie! Of course, you can also add nutritious extras to any smoothie: handfuls of cooked or raw greens or other vegetables, slices of avocado, calcium/ multivitamin/ probiotic powder, a tablespoon of ground flax, etc. Let's hear from all the other summer smoothie addicts out there: what are your favorite combos? P.S. 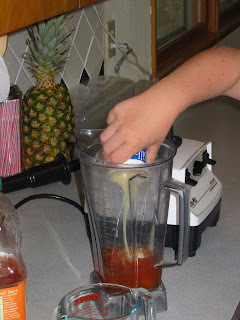 I think this smoothie recipe will work in a regular blender, but I can't guarantee it. I swear by the Magical Super Power of the Vita-Mix to blend absolutely anything. I know it's expensive, but compared to the other blenders I've had it makes a world of difference. Okay, so we've talked about finding vegetables and fruits locally and on the cheap. Now that your fridge is full of them, how do you get the kids to actually eat them all summer? I think one of the keys is to make fruits and vegetables the number one most visible and easy-to-reach food items in the house. Don't leave them tucked away in the crisper drawer, unwashed in plastic bags. If they're on the counter when the kids run by, lookin' cool, crisp, and ready-to-go, kids are more likely to grab and eat them. Of course, it also helps to ditch the junk food or at least keep it out-of-sight, and perhaps rule out other foods for between-meal snacking. But even though I think they should be out and available, I don't want them to get dry, wilty, or touched by flies. Yuck! This year I stumbled across a great solution at Bed Bath & Beyond: this Condiments on Ice tray with five 2-cup compartments. It has a clear lid that leaves the goodies visible and an ice compartment to keep everything cool. (They also have an Appetizers on Ice tray; I liked the dip holder, but the tray doesn't have a lid, which is a must for me, what with the whole fly touching issue). Each late morning or early afternoon I fill the bottom of the tray with fresh ice and load it with whatever fruits and vegetables I have on hand. When the ice gets melty I pour off the water and add a bit more; at the end of the day I add whatever's uneaten to dinner or save it for leftover soup. 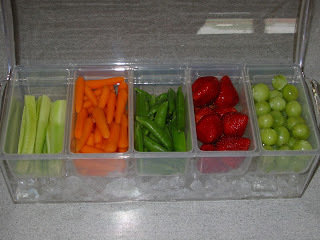 (1) baby cucumber spears, baby carrots, sugar snap peas, organic strawberries and green grapes. 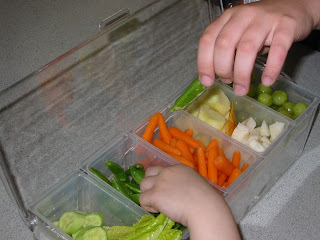 (2) cucumber slices, romaine leaves, sugar snaps, baby carrots, jicama and apple slices (in one container with a small plastic divider), and green grapes. 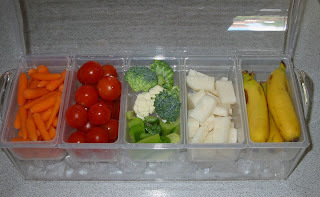 (3)baby carrots, grape tomatoes, celery, broccoli, cauliflower, jicama, and baby bananas. The daily Filling-of- the-Tray has become quite an event at our house, especially when the neighborhood kids are over. I tell you, I'm not sure why everyone insists that kids won't eat fruits and vegetables and you have to hand out candy and popsicles if you want them to like you. I've watched these containers empty in a matter of minutes. One little girl ate almost an entire cup of sugar snap peas before she stopped and held one up to me. "What are these?" she asked.